To design one’s world, whether in the physical or digital domain, is to increase one’s sense of agency. It is the realization that you can shape your world rather than having it shape you. For Minecraft, this is an opportunity for creative game play. For architects, its an opportunity to address the crises in urban housing. Minecraft, the immensely popular, on-line video game, feels like a place that you visit, as much as a game that you play. In Minecraft, the players are the architects of their digital world. The programmers behind Minecraft occupy a God-like role, creating the ‘game space’, the universal laws, and the Minecraft ‘blocks’ from which players construct their ‘builds’. Minecraft does not merely present a complete universe to explore; it is a DIY (Do-It-Yourself), open-source, digital construction system that is set in a collaborative environment. Rather than just competing with each other, Minecrafters may cooperate on immense ‘builds’, from planets to skyscrapers. The players have adopted an open-source approach, sharing textures, technical know-how, and entire constructions for others to play around with, cut apart, and expand upon. A similar open-source, DIY, and collaborative ethos plays out in recent architecture projects by Teddy Cruz, Alejandro Aravena, and the WikiHouse Project. All of them have designed fabrication systems for non-architects to design and build their own homes, using open-source plans. Like Minecraft, these architecture projects are collaborative on two levels. On one level it is a collaboration between the architect, who designs a building system and the person who uses the system to design and assemble their own house. Though the user of the system has the freedom to explore a nearly unlimited space of possibilities, it is not aesthetically neutral. Just as Minecraft has its unique blocky aesthetic, so does the fabrication systems designed by each of the architects. The aesthetic qualities of prefabricated steel bolted frames or CNC cut plywood panels always visually express themselves. 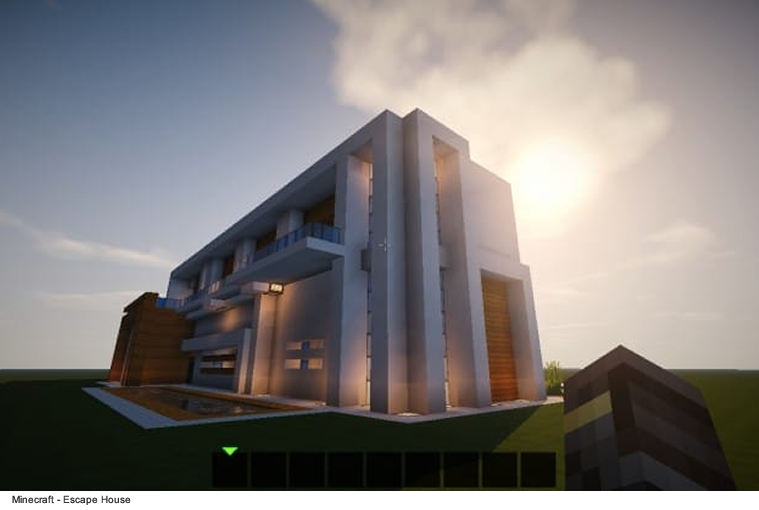 At another level, Minecraft ‘builds’ and the DIY houses constructed from open-source building systems, are often the product of collaborations. 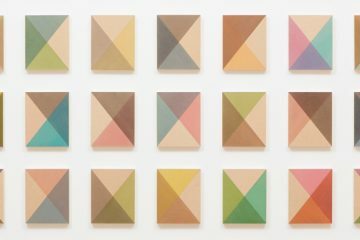 A dozen people may work on the same project, whether it’s stacking digital blocks or dowel connecting wood panels. Because these systems are easy to learn anyone can become a skilled builder and a valuable collaborator. Minecraft occupies an enormous amount of real estate in cyberspace. As reported by engadget “Minecraft was the second most popular search on You Tube in 2014…ranking immediately behind the word “music” in terms of search frequency.”  Most of these You Tube videos are tutorials by Minecraft players on how to build things: sliding doors, coastlines, floating buildings and almost anything you can imagine. Minecraft operates in two modes, Survival or Creative, whose names accurately reflect the primary type of play. In the Creative mode you can play in your own sandbox or choose the Multi-Player Option, which is where I’m focusing. In Minecraft a textured modular ‘block’ is the basic building material and stacking is the primary method of construction. 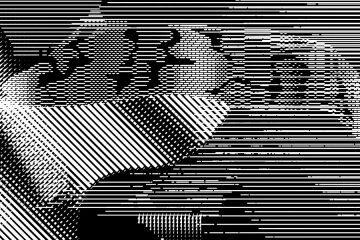 This system of digital building blocks, much like legos, have a pixelated, low resolution quality. 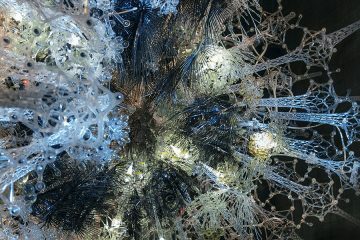 Objects often look as if their microscopic Mandelbrot structure has been magnified to reveal each individual stacked molecule. Unlike raw stone, which can be sculpted into smooth curves, Minecraft blocks always maintain their essential blockiness. Every block has perfect orthogonality, an even distribution of internal mass, identical compressive strength, and a non-slip surface made for creative stacking. Blocks can be textured and turned into anything from stainless steel to water. 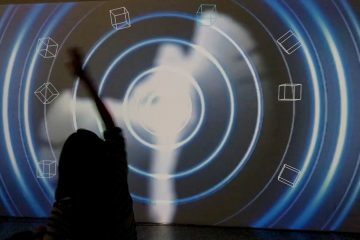 As a system for creative expression, these digital building with blocks could sound creatively stifling, but within these limitations the players explore an endless range of possibilities. In its multi-player modes, Minecraft enables many players to work on the same build. Minecrafters often treat their original designs as open source, raw material, inviting other players to download. The player, Sacred Diamonds, designed, Escape House, a sprawling modern house without an interior. “That job is up to you”, he or she explains. Gender identity rarely rears it’s head in Minecraft and neither does race, religious belief, or creed. 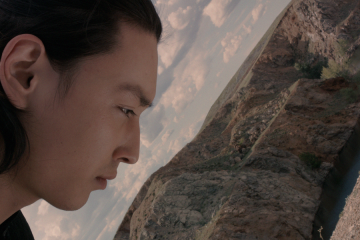 This make makes collaboration even more fluid. A Minecrafter’s identity depends on ‘what’ they build rather than ‘who’ they are. There are countless Minecraft Wikis and hundreds of forums that further catalyze open-source collaboration. Minecraft players post resource packs filled with painstakingly created textures and encourage other players to download them. These same players will often share the details of how they made a resource, empowering other players to do the same. Minecraft created the eco-system, but its the players who created the sharing economy and built the communities. In the physical world of our modern cities, buildings are designed by architects and built by professional construction workers. The client has a passive role in this process. When the building is complete, the owner can move the furniture, but not the walls. That is the traditional relationship between architect and client. For a growing number of architects, this tradition has been turned upside down in order to deal with the challenge of low-income housing. Unlike in Minecraft, the architects in the physical world face economic constraints that have social and political implications. Minecraft’s digital universe is disconnected from the world of poverty, while architects in the physical world must grapple with it. In Minecraft anyone, regardless of their economic situation, can design and build the castle of their dreams. A poor kid from Tijuana can log into Minecraft and enter a sprawling castle of fantastic minarets, while his physical self sits on an old mattress in a metal shack. The lack of affordable housing in the world’s fastest growing mega-cities is a crises that will only get worse. This is an impossible task using normal construction methods. Its not surprising that the shanty towns have organically grown up around the fastest growing cities, filling the gap in affordable housing. For a growing number of architects, the answer lies in designing DIY, open-source building systems. Ironically, Teddy Cruz’s DIY and open-source approach to the housing crisis was inspired by the very same favelas and shanty towns that mega cities like Rio di Janeiro, Johannesburg, and Tijuana want to replace. A shack in a Rio favela grows over time. This makes them relatively cheap to build. As a family’s financial situation improves. This incremental approach is the economic model that Cruz adopts for public housing. The amount of money needed up front for this type of housing typology is dramatically less expensive than the typical social housing development. Minecraft uses the same economic model in its creative mode of play. Rather than spend millions of dollars to design all of the virtual cities and digital buildings, they let the game players do it. By empowering the game players to design and build their own world, Minecraft effectively outsources the design of its worlds to an army of very motivated amateur architects. And that is exactly the point. For the Minecrafter, design and construction is a form of play. 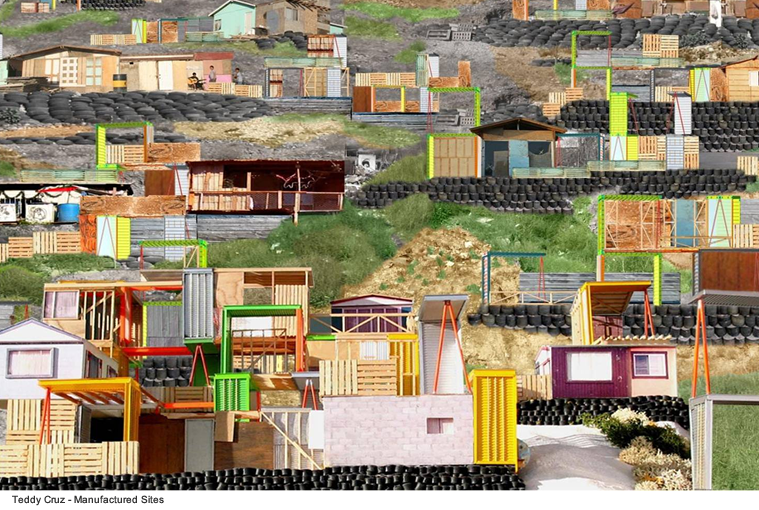 Teddy Cruz’s project, Manufactured Sites addresses the shanty towns of Tijuana, Mexico, a city that is in dire need for safe, clean, affordable housing. Cruz noticed that residents of Tijuana’s shanty towns were crossing the border to San Diego and bringing back salvaged building materials and even complete houses scheduled for demolition. Back in Tijuana these houses are often rebuilt haphazardly on columns over muddy hillsides. The result is housing that is structurally unsafe and lacking critical infrastructure. For Manufactured Sites, Cruz proposed a simple intervention: a weld-less, bolt-together, steel frame that is as easy to assemble as Minecraft’s blocks are to stack. For the design of Manufactured Sites, Cruz was inspired by the shipping pallet racks that were manufactured by a local maquiladora. Cruz turned this racking system into a modular, prefabricated structural system. The owners develop the house around this framework using found recycled materials. The stable, secure structural frame, affords infinite possibilities, such as freeing the space below for future development. Teddy Cruz describes how “This small piece is also the first step in the construction of a larger, interwoven and open-ended scaffold that helps strengthen an otherwise precarious terrain, without compromising the improvisational dynamics of these self-made environments”. Cruz’s typology of raised houses, encourages small businesses to open on the ground floor where they can have street level storefronts. This mix of residential and commercial use creates a more vibrant and productive city. Its no coincidence that a collaborative environment like Minecraft also wants to create a vibrant and productive environment. Most multi-player games are collaborative by nature, where players fight together against a legion of zombies or a ruthless gang in a post-apocalyptic landscape. Whereas in the Creative mode of Minecraft, collaboration is mostly about building things. Like Minecraft, Cruz sees his role as a ‘facilitator’ rather than a builder. Cruz and Minecraft and share similar goals, empowering people to be creative and greasing the wheels of social collaboration. For his Nicaragua Housing Project, Cruz designed a combination structural beam and rain water capture system. This dual function beam is both the structural and infrastructural core of houses that local resident use as a starter kit to build their own house. The last two are systems of construction rather than complete buildings. Cruz combines the winning trifecta of prefabrication, shared infrastructure, and an open source collaborative environment. Nothing about his system is proprietary. Its meant to be shared and modified and shared again. 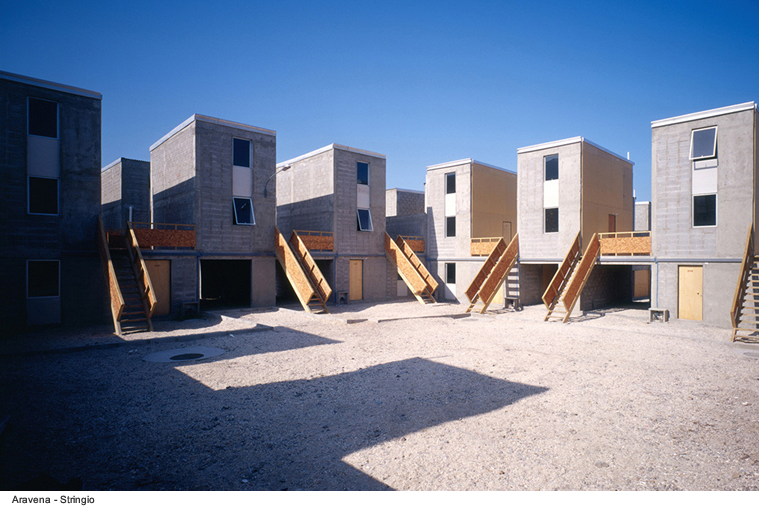 The Chilean architect, Alejandro Aravena and his firm Elemental use the same incremental model as Cruz and are equally inspired by the favelas for their public housing projects: Quinta Monroy, Barnechea, Monterey, and Villa Verde. These housing projects look incomplete: a half of a house built within each structural bay, leaving the other half empty. This ‘half of the house’ is a fully functional, complete home, but it is half the size of a normal house and thus cheaper to build. The half house projects occupy only half of their allowed space. But that is only temporary. Aravena’s incrementalist approach is to build the minimum size home, while providing the structure, infrastructure, and space for the house to expand over time. As with Cruz, the owner is responsible for designing and building out the rest of the space left. The architect and the home owners are collaborators in the final design. Because his collaborators work sequentially after Aravena has completed his half of the house, he cedes control over the final outcome. And that’s the way he wants it. Like Cruz, his projects are open-source. Anyone can download a complete set of construction drawings for one of his ‘incremental buildings’ and modify them as they fit. Though the context is radically different, social participation is also at the heart of Minecraft’s allure. The game is designed to make it easy for players to collaborate on the same building or an entire world. 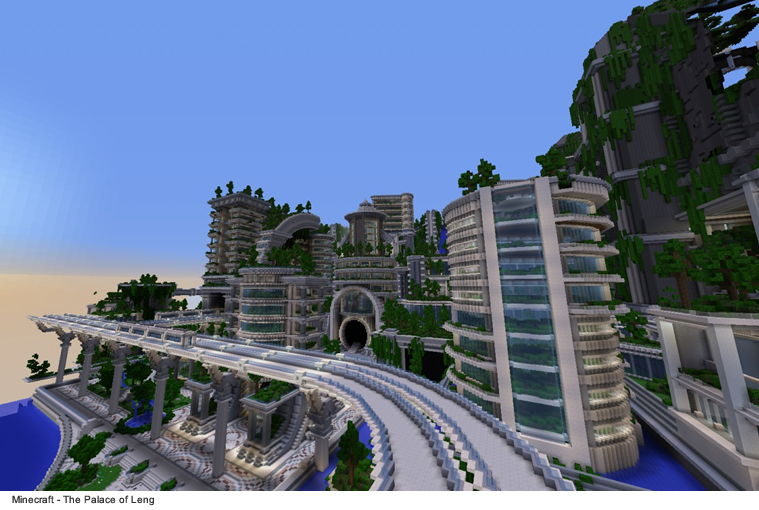 Instead of re-defining affordable housing, Minecraft,and other World-Building video games such as Sim City and Spore have redefined game play. 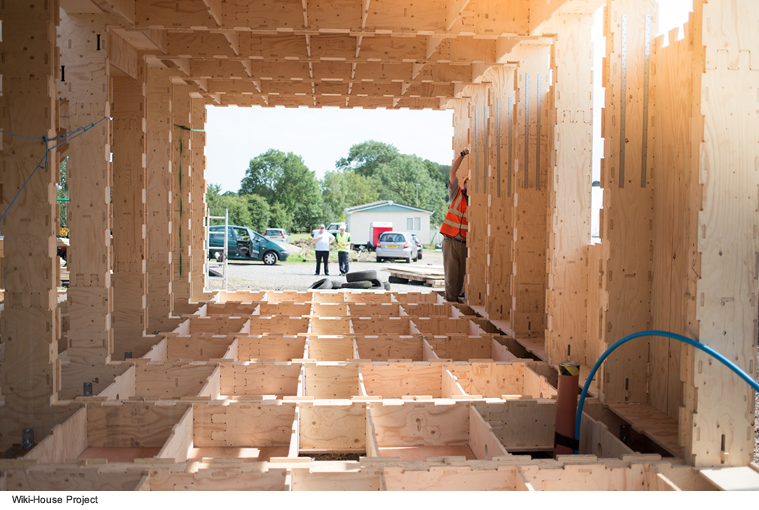 The WikiHouse Project, by Alastair Parvin and Nick Lerodiaconou, is an open system of prefabricated parts. 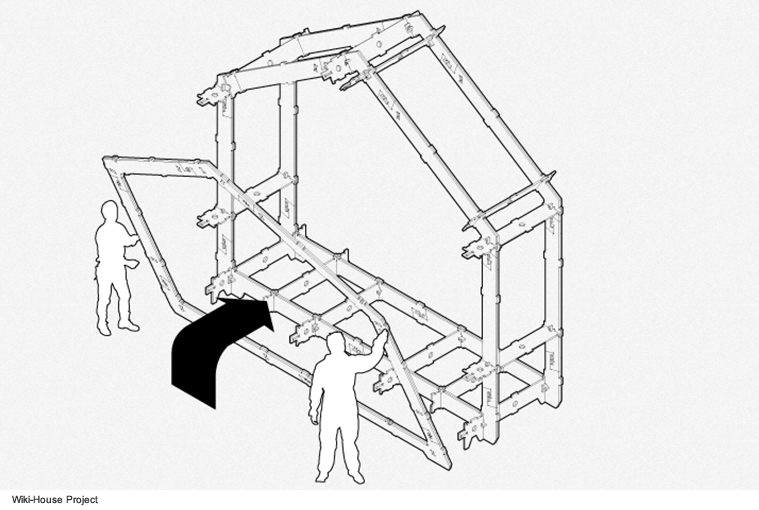 Like Minecraft and the other open source architecture projects, it is relatively easy to assemble a WikiHouse. 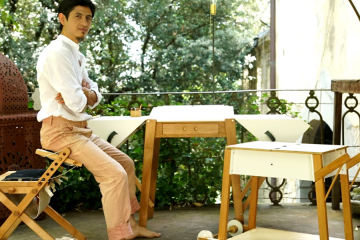 It assembles similar to a piece of Ikea furniture— though perhaps with less frustration. 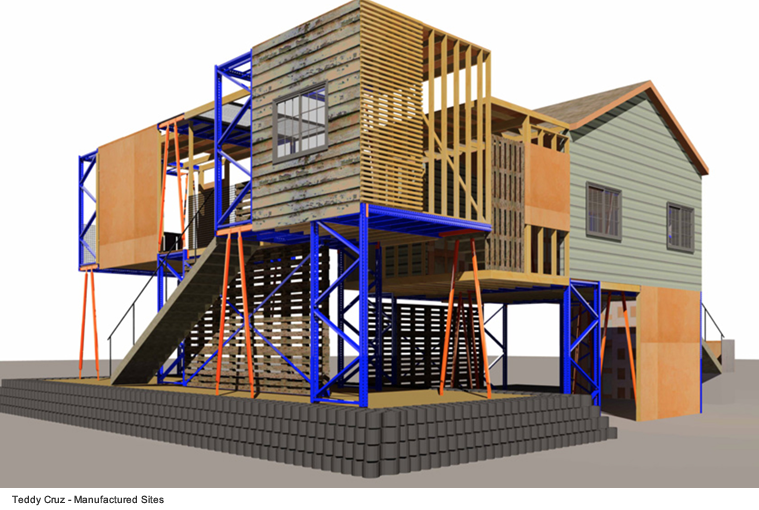 Where Minecraft uses stacking and Teddy Cruz uses bolting, the WikiHouse uses large dowels to connect its prefabricated parts. A dowel system of a smaller scale is used to connect parts for Ikea shelving units. Given the simplicity of a doweling system, which requires few tools and limited skill, it is a natural choice for connecting parts. All DIY fabrication systems – whether used for housing or Minecraft cities – depend on simplicity. The stacking used by Minecraft is the simplest of all construction systems – which is why the ancient Egyptians and Mayans used it. The WikiHouse finds a balance between the limitations imposed by its parametric tools and the freedom for experimentation. 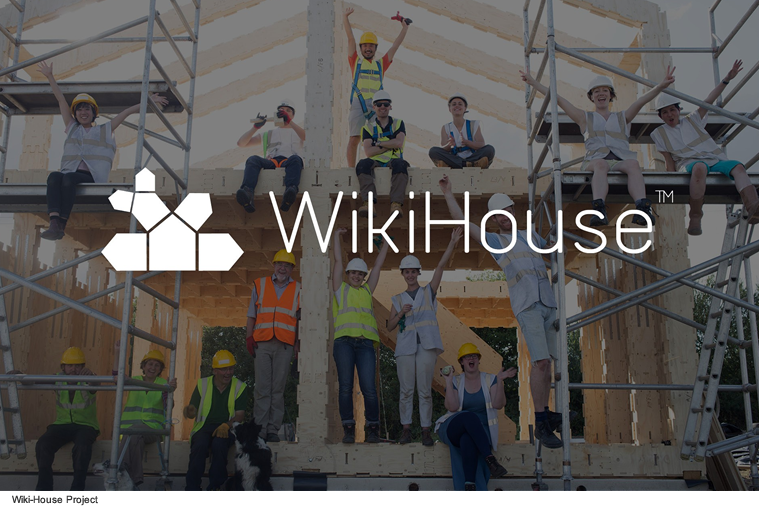 The drawing files of the basic WikiHouse prototypes are open-source and available to anyone connected to the web. To control costs, the CNC machines that cut the plywood into pre-fab panels are shared from a central location. This catalyzes collaboration, the sharing of ideas and the swapping of construction techniques. For the average person, designing and building their own house seems an impossible task given the technical and financial hurdles. The WikiHouse system makes this possible. Traditionally, video games and buildings, are designed in advance as a complete product and built by professionals to exacting specifications. Minecraft, the DIY open-source architecture of Cruz, Aravena, and the WikiHouse are incomplete, half-built, and open-ended. They embrace unpredictability, variability, and improvisation. They also catalyze and facilitate collaboration. The Third World countries are struggling to meet their housing needs. The open source prefabrication systems of Cruz and the WikiHouse and the half-finished houses of Aravena offer an answer. The housing projects of Cruz and his fellow travelers are not trying to put architects out of work, rather they are redefining their role: the architect as system designer and the client as the system user. This is the same role that Minecraft has with it’s players. Rather than dropping players into a completed world, Minecrafters build their own. There are structural forces such as community norms, political systems, and social class, that limit our agency in the world. Growing up in poverty vastly diminishes your options in life and making it a much harder climb. There are also non-structural forces, the daily trials and tribulations of life, that get in our way, thwarting our will. Life throws us constant curve balls: a flat tire that makes you late for work, a printer that runs out of ink, a roof that springs a leak. Sometimes it feels that our agency in the world is an illusion. What makes Minecraft and the DIY building systems compelling is the way they satisfy our desire to have real agency. Rather than the world having its way with us, these systems empower us to build our own world: whether that’s a house in a favela or a digital city in Minecraft.